A tour! From options of zip lining to cooking schools, we opted for a bicycle tour just on the periphery of Chiang Mai. With cruiser bikes, a German traveller (sehr gut!) and Wit, our Thai guide, we set off on a leisurely tour. Turns out there was more eating than calorie burning! The leper colony (which now houses disabled and elderly survivors) was our first stop, likely because it was deserted and easy to test out our biking skills on the left side. Or for the less skeptical, the stop clarified that leprosy still exists and a small but significant 100+ cases were found in Thailand this year. I did admire the ADA compliant houses for the folks, and their prosthetics center. After this food for thought, our next stop was for fried bananas, much more satisfying than Goo or a powerbar. 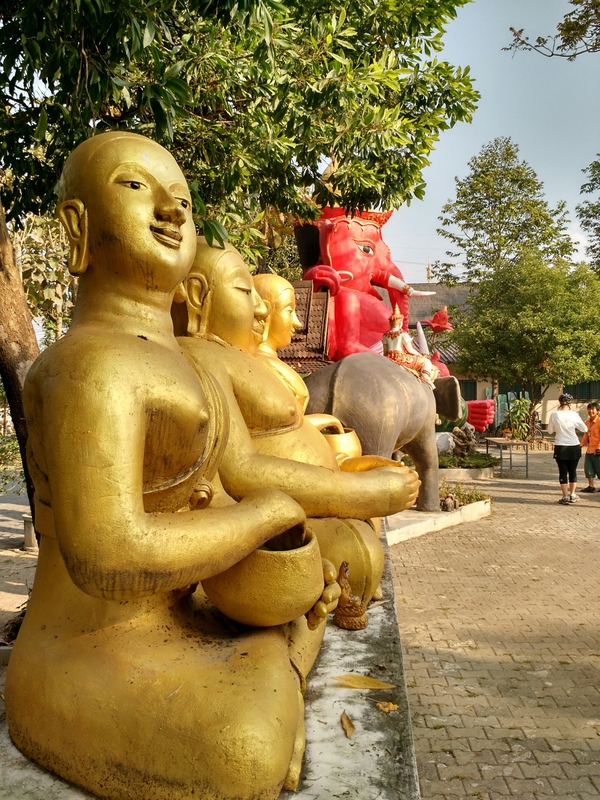 Cycling a bit further, we visited a temple to Buddha and his Hindu friends, including the ever popular Ganesh, the famous elephant headed god of wisdom and learning, as well as remover of obstacles. We learned about how Thais track which day of the week you were born more than the birthdate itself, and that temples often have statues for the different Buddhas for each day of the week where you can make an offering to your birthday. 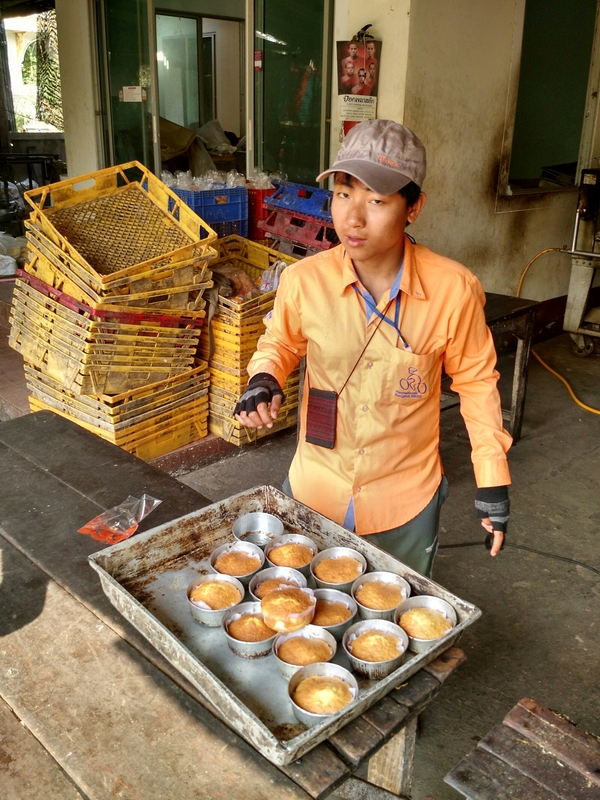 Our next stop was like birthday cake – cupcakes from a family run business offered to us straight from the oven! We also stopped at a school where we were the drop in English tutors. 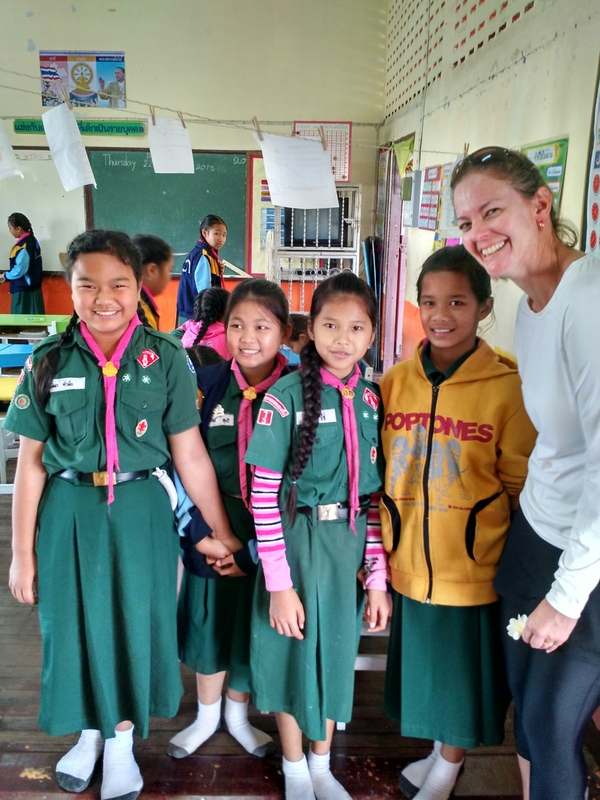 Some brave girls converged to ask, “What is your name?” “What sport do you like?” I tried to think what else they might have learned in English and asked what weather they liked, sunny or rainy. They said rainy, and I said I liked sunny. They commented more in Thai, which Wit smiled and translated as, “they say that’s because you are white.” Cultural exchange: check! Our last good stop was for lunch, and the classic khao soi again. $1 lunch, and very tasty! Our German traveller was surprised to hear that it was cheaper for Thais to eat out than eat home. We biked back past longan berry fields, jackfruit and papaya trees, and really enjoyed the fresh air and scenery. Full from sights and tastes, the rest of our day was lazy wandering around bookstores and coffee shops. Just found the business card from the hotel we stayed at in Chang Mai. Don’t know if the Montrara Happy House is still in business. Yes. It was a very happy house. Glad your travels are treating you well. The old city was super convenient- I think we started off not far from where you were. Following in big steps to fill! Love the picture of you and kids – I think we have a similar one!